﻿Sydney An Fern Elizabeth Rotigel-Finegan﻿: Hello! Excuse the random information that follows... I'm 15 years old and will be a freshman this fall. High school= scary. In my free time (which I don't have enough of), I make no-bake cookies (YUM) and cookies of other sorts, paint on my basement walls (also on canvas, but that's not as fun), and of course READ! When I was little my mom had to tell me,"The books are sleeping" so I would stop waking her up in the middle of the night. At four years old I also hoped to be a crayon-maker, and then a pig-poop-scooper. Don't ask me why. I've changed my mind since... disappointing, I know. I would very much like to be an author/illustrator one day; Marleigh Thorn and I have plans to be journalists and run a P.I. office on the side. We're a bit mischievous. Anyway, I'm thrilled to be a TAB member at the Richland Community Library and promise to be a faithful blogger (like John Watson)! P.S. Other hobbies include: Horseback-riding, traveling, photography, Sherlock, Merlin, writing, running, high jump, law, psychology, being fabulous, etc. This is one dynamic duo (they're also Dauntless). Marleigh Thorn: Hi all! Marleigh here! I'm the lovely dauntless initiate on the left, by the way. As you probably can tell from our TAB-ulous picture, both my sister and I are EXTREME book nerds, the Divergent trilogy being one of many of my favorite reads. Like Sydney, I am also 15 years old (fun fact, she's just one day older than me) and going into my freshman year in High School. Some of my hobbies include reading and writing, making fun juices with my lovely juicer I got for Christmas a few years back, and hanging out with friends! I hope to be a journalist (or any form of author, really) when I grow up during the summers, while I take on a job of either an English or Music teacher during the school year. I also would like to dabble photography when I'm not grading papers. And of course, as Sydney also said, I would be interested in taking a P.I. job alongside all of my other crazy careers. I also, am overjoyed to participate in Richland's T.A.B. and hope to keep you updated and interested in the activities at the Library. 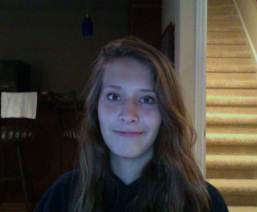 Annie Thorn: Hey guys! My name's Annie. 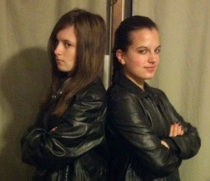 I'm the Dauntless on the right rocking the french braid and leather jacket. I'm 15 years old and plan on attending Gull Lake High School and KAMSC next year. After high school, I plan on going to college and getting a degree in Veterinary science. I enjoy writing stories and poetry. The first chapter books I ever read were The Chronicles of Narnia by C.S. Lewis, and I must say I've read them many times after that. Some other books I enjoy are the Divergent trilogy by Veronica Roth and The Fault in Our Stars by John Green. When I get the chance, I plan on reading The Lord of the Rings trilogy and Unbroken by Lauren Hillenbrand. My favorite TV shows are Merlin, Once Upon a Time, The Quest, and Downton Abbey. I play soccer and run track (and still haven't decided which to choose this coming spring). Some other hobbies are drawing, horseback riding, 4-H, and Broadway musicals. Madison Charlton: Hello! I'm under assumption that since you are reading this you would like to learn a dash about me, so here I go! First off, my name is Madison Charlton and unlike the previous lovely ladies, I am fourteen years of age and currently diving straight into freshman year of Gull Lake High School. My leisure is mostly packed to the brim with sports, but all things Disney, Netflix, and obviously reading fill up the cracks! Softball and Color Guard (a.k.a. the people who twirl the flags in the marching band and make the whole thing worthwhile; YES it is a sport!) are without a doubt my indispensable sports, but in addition, I take part in volleyball, swimming, skiing, and tennis! Comparable to the sports, Netflix takes up a TON of time, although selective. Mostly, its area for expertise is getting you hooked on a show and persuading you to waste entire months of your life with just one swoop! (I speak from multiple, dreadful, experiences - Lost especially.) We have a love-hate relationship… Anyhow, like I expressed before, I absolutely adore reading when I have actually have the duration of peace to do it. Undeniably, my favorite book is The Book Thief by Markus Zusak! The runner-ups include Miss Peregrine’s Home for Peculiar Children, the Maze Runner trilogy, and the Divergent trilogy. However, in the end, I contrast with quite a few people because I am presently oblivious to what I career I want to pursue! But, with hope that will change punctually! Tova Carter: Hey, how are you? wait. Okay, Hi, let me first introduce myself, My name is Tova Miranda Carter, and I am currently attending GLHS as a freshman. Honestly, I am a little eccentric. As described by many of my friends and family. I enjoy Sherlock, Marvel Entertainment, Game of Thrones (I'm a Targaryen), Star Trek, Doctor Who, Lost (thanks to Madison Charlton), A Young Doctors Notebook (BBC mini-series with Daniel Radcliff and John Hamm, check it out), And I absolutely adore Wes Anderson, I could go on for hours about him. I tend to be more of the film geek out of my friends, watching almost everything that looks good. That is part of the reason why I am striving to be a cinematographer. Hopefully one day I will have the chance to work with Marleigh on a script. I am currently working on a documentary about the Invasive Species that are taking over the natural wildlife in Michigan. Which will hopefully be completed before the end of next year. But I love the art of storytelling through any form, which probably came from the fact that in our home we read for hours and instead of music we listened to Lake Woebegone Days. I remember listening to the story about the Jell-o brain from the state fair over and over again. In hindsight, I probably should have listened to a few different stories, but Whatever's Right. 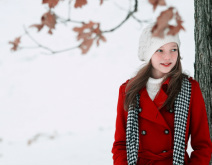 Gracie Monroe: Hi I'm Gracie Monroe, I'm a 7th grader who enjoys books. I'm just a giant nerd. I love Doctor Who (11th Doctor's my favorite), Sherlock, The Avengers, Supernatural, Merlin, Harry Potter (I'm a Ravenclaw), LOTR, and popular youtubers. I enjoy writing and doing different kinds of art in my free time along with browsing Tumblr and and reading books.I also enjoy a wide variety of music (my favorite bands are Coldplay, Pearl Jam, and Edward Sharpe and the Magnetic Zeros) and my favorite song can change on a daily basis. My dream job would be to be creative writer (Even though I'm to shy to show my family what I've written let alone strangers), but I'd also like be a college professor for English Literature, or going into journalism. I'm not very sporty and most of the time I will be found absorbed in a book. Mackenzie Jonas: Hi! As you may already have guessed... my name is Mackenzie Jonas! (sorry if this is really long, I like to type) And like all of the wonderful people before me, I am a freshman in highschool and I am 15 years old. I love to write my own works, let my artistic side show, and of course... I LOVE to READ! I'm a devoted Nerd Fighter (Hi John if you're reading this!!!) I am also a very devoted SuperWhoLockian (basically I practically worship the shows Supernatural, Doctor Who, and Sherlock) and I also like Merlin, the Avengers (Doest mother know you wearth her drapes? ), Once Upon a Time, and Harry Potter ( GO GRYFFINDOR!!!! ), and let me warn you, if you ever meet me, do not talk to me about these topics because I could literally go on forever talking about these things. But anyway, lets talk about Books! My favorite book is at the moment probably FanGirl, which I will review, later on. My favorite book series is by far Ms. Peregrine's Home for Peculiar Children (I'm just going to say that I will be reviewing a lot of my favorite books, with everyone's OK of course). My favorite author is... lets just say I'd have to ponder that concept for a very very long time, but at the moment I'd have to say it is Holly Black (she wrote the Spiderwick Chronicles and many others) because her books are one of my many inspirations to write. And my favorite genre varies daily. And as you may have guessed, my dream job is to be an author. Ever since I was little, my eyes would see something and I would want to write about it or draw it, but since I was little and was illiterate, I drew it. Okay.... I should probably tell you that my greatest fear is endings. And I have to end it here. But it's not the end, it's the beginning. I will be blogging as much as I can (highschool is very demanding). So I'll see you on the blog! Bye! Jessica McMillan: I'm Jessica, as evidenced by the bold text to the left. I'm a Ravenclaw, an Erudite (not the crazy power-hungry kind), a Oncer, a demigod (Child of Percabeth), a tribute, a grenade (TFiOS), a Sherlockian, a waterbender (ATLA/LoK), a Disnerd, and an Ozian (Wicked) (So far. I get a new fandom every few months). I am currently reading Out of Oz, the last book in the Wicked Years quartet. My favorite books are the Harry Potter series. My dream job would be to play Elphaba in a Broadway production of Wicked. "I don't cause commotions, I am one" pretty much describes my life. So if you care to find me, look to the western sky. Arianna Dugan: I'm Arianna. (this is going to be long, trust me.) I am 13 years old and a soon-to-be freshmen. I am a book nerd, writer, tennis player, alto saxophone player, hair ninja (if you don't know, I don't know how you live with yourself) , swimmer, skier, and piano player. I am a huge fan of Lord of the Rings, Harry Potter, Percy Jackson, Hunger Games, James Bond, Divergent, Dancing With the Stars (don't even get me started on who should have been kicked off when), and Marvel, to name a few. I could probably go on forever with things I like, but fortunately for you, I won't. Right now I am reading The Return of the King (:D) by J.R.R. Tolkien and The Young Elites by Marie Lu. My favorite movie is probably either The Two Towers, Skyfall, or Avengers: Age of Ultron. My favorite author is probably J.R.R. Tolkien at the current moment, although that constantly changes. My favorite colors are blue, grey, and mint green. I am a huge music fan (especially country music!) and have a guitar signed by The Band Perry and Chris Young (If you don't know who they are, I shun you.). I am also a HUGE 80s music fan (people like to tell me that I am a child of the 80s, not actually born in the 80s) and Billy Joel and Bon Jovi have probably been the soundtracks to my life. My favorite song right now is probably either "Home" by Blake Shelton, "You Give Love A Bad Name" by Bon Jovi, or "Who Says You Can't Go Home" by Bon Jovi and Jennifer Nettles. I am also getting ready for Marching Band season 2015 (In the Shadow of Dragons) on the color guard team. My dream job is something to do (preferably) with architecture, but I will do anything in the engineering part of life. I've always been taking apart things to see how the work and trying to put them back together (Sadly, half the time it doesn't work after I get my hands on it). Courtney Pedersen: Hi I'm Courtney! I am fourteen and a freshman in high school. I like to read, write, bake, cook, play tennis, hang with friends, and be a totally typical teenager. I love purple, turquoise, lime green and teal. My favorite books are Divergent, The Fault in Our Stars, The Selection series, and After ever After (the book not the you tube video). I am so awesome that my group of friends have actually "named" a genre after me. So the genre is called Courtney books. We have named them this because they are super sappy teenage realistic fiction like the ones where teenagers complain about there lives, well those are like my life and my friends say they are too sappy so we will forever call them Courtney books. So now on to movies, my favorite movie is probably Mean Girls. So yeah bye!